How much is Juan Mata Worth? 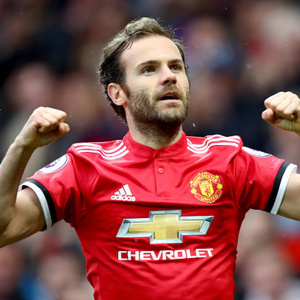 Juan Mata Net Worth and salary: Juan Mata is a Spanish soccer player who has a net worth of $55 million. He plays attacking midfielder and winger for the Spanish national team and the English squad Manchester United. Juan Mata was born on April 28, 1988 in Ocon de Villafranca, Burgos, Spain. Mata played for Real Madrid B in the Segunda Division during the 2006-07 season, scoring 10 goals in 39 appearances. After that season, he moved to Valencia, where he played four seasons, scoring 46 goals in 174 appearances. Mata hopped over to the Premier League in 2011-12, netting 33 goals in 135 appearances. In 2013-14, Mata joined Manchester United, scoring six goals in his first 15 appearances. With Spain, Mata's scored nine goals in 30 appearances. With Valencia, Mata won the Copa del Rey in 2007-08; with Chelsea, he won the FA Cup and UEFA Champions League in 2011-12, and the UEFA Europa League in 2012-13. With Spain, Mata won the 2010 FIFA World Cup, the 2012 European Football Championship in 2012, and the UEFA European Under-21 Football Championship in 2011. Also in 2011, Mata won the UEFA U-21 Championship Golden Player, Bronze Boot, and was named to the Team of the Tournament. He's been named the Chelsea Player of the Year in 2011-12 and 2012-13.